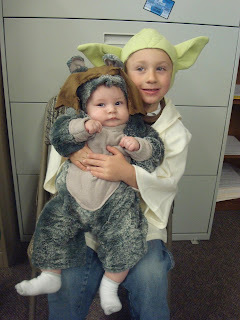 Ryan is REALLY into Star Wars right now, so he decided that he wanted to be Yoda this year. And who better to join him than an adorable little Ewok! Tanya, Marcus' day care provider made his costume w/o a pattern, and it was PERFECT! They had a great time, and Ryan has enough candy to last till next year! Happy Fall from the Grattan 4! Things have been busy around our house this fall, Ryan is doing well in school, and is currently in karate lessons. He really likes it, and just moved to his 2nd belt! Marcus is now over 4 months, he just had his well child visit and he is 26 inches long and 16 lbs! He is happy as ever, even though he is trying to get a tooth or 2. He is doing great at day care, smiles and talks all the time, and is a great snuggler! We are all getting over being sick, but doing well. We are excited for Halloween tomorrow, and I will get pictures up as soon as I can. We took the boys to the pumpkin patch and corn maze and had a great time. Hope all is well with everyone, love to all. Well, the day has come that I had to come back to work. 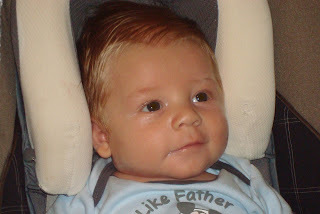 I really had a hard time this morning dropping Marcus off at day care for the first time. I know he will be okay, it is me that I am worried about! He is almost 11 weeks old, over 13 lbs, and growing every day. My mom was here for 2 weeks, and she swears that he changed a lot while she was here. He is a great baby, very sweet, full of smiles and laughs, and has figured out that he has a tongue, so he looks like a lizard some times. Ryan is a great big brother! 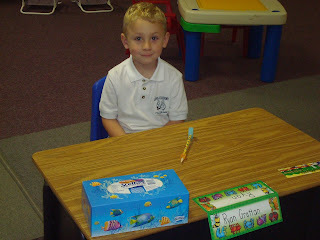 He started school last week, and is doing really well. He looks so cute every day with his huge backpack! He loves Marcus, and is a great helper. That is about all from here for now. I am thinking about heading out early, I miss the boy so much! I am so glad that I have an understanding boss and flexability! I've got a couple of videos I'll be putting up soon too!